MADISON — Records are made to be broken, and anglers quickly proved this truism in the first year of Wisconsin’s new program recognizing catch-and-release state record fish. Traditional state records for fish by weight also fell in 2017, but the bigger story was the multiple first-time records hauled in by two anglers. “We’re happy that some anglers have taken advantage of the new Live Release record fish category. We’re expecting a lot more activity in 2018 as more people learn about this exciting opportunity,” says Karl Scheidegger, the Department of Natural Resources fisheries biologist who coordinates the state record fish programs. Rod Eberly of Appleton secured a spot in state fishing history when his 17.75-inch white bass, caught and released May 8, 2017, was recognized as Wisconsin’s first ever catch and release record. His record, however, was short-lived. Kevin Larson of Hudson knocked Eberly off the leader board with the 18-inch white bass he caught and released on Cedar Lake in St. Croix/Polk counties on Aug. 23. Larson edged out Eberly’s bass out by a quarter of an inch. Erika Carter of De Pere became the first female angler to set a new catch and release record in Wisconsin and bested an existing catch and release record. Carter caught and released an 8.75-inch pumpkinseed sunfish on July 4 from Lake Noquebay in Marinette County. Her haul bested the 8.25-inch pumpkinseed sunfish Eric Amenda from Germantown caught and released May 28 from Pleasant Lake in Waushara County. Aaron Fuchs of Baraboo wrestled a 47-inch flathead catfish on September 3 from the Wisconsin River in Sauk County. The fish was returned to the water with a ceremonial SPLASH! Jacob Holmstrom from Danburry caught and released a 53.0-inch musky on June 24 from a Burnett County lake. DNR recognizes live release records by length for specific fish species meeting qualifying lengths. 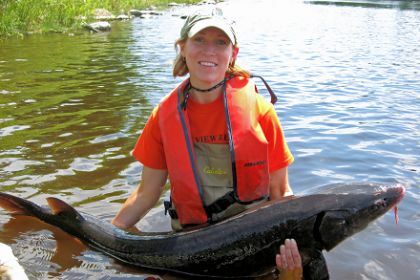 The angler is required to submit an official record application and photos showing the fish lying along a ruler or other measuring device, and with the angler, which are reviewed and certified by DNR fish biologists. Anglers in the traditional state fish record categories landed 11 new records in 2017, with two anglers accounting for six of them. DNR recognizes anglers who have legally taken the largest fish on record by hook and line, as well as those fish that have been taken by alternate methods including spearing or bowfishing. She established the first-ever record for stonecat with her 9.3 inch, 5.4-ounce fish caught from the Wisconsin River in Lincoln County; established the first-ever shorthead redhorse record with an 18.9-inch, 1 pound 12.1-ounce fish caught from the Prairie River in Lincoln County; and bettered the existing golden redhorse record by about 1/4 pound with a 21-inch, 3-pound, 1.4-ounce fish caught from the Prairie River in Lincoln County. Shawn Schmidt of Denmark Wisconsin established a new alternate method (spear-gun) record for yellow perch with a 14-3/4-inch, 8-ounce. fish taken from Lake Michigan in Kenosha County on June 22, 2017. These records bring his alternate method (spear-gun) record total to seven, for rock bass, bluegill, black bullhead, yellow bullhead, round goby, yellow perch and pumpkinseed. Anglers who want to pursue state records for less well-known fish species will want to make sure they do not possess endangered and threatened fish species. In a year when anglers hauled in a stringer full of state record fish, Parker Welch’s feat stood alone. 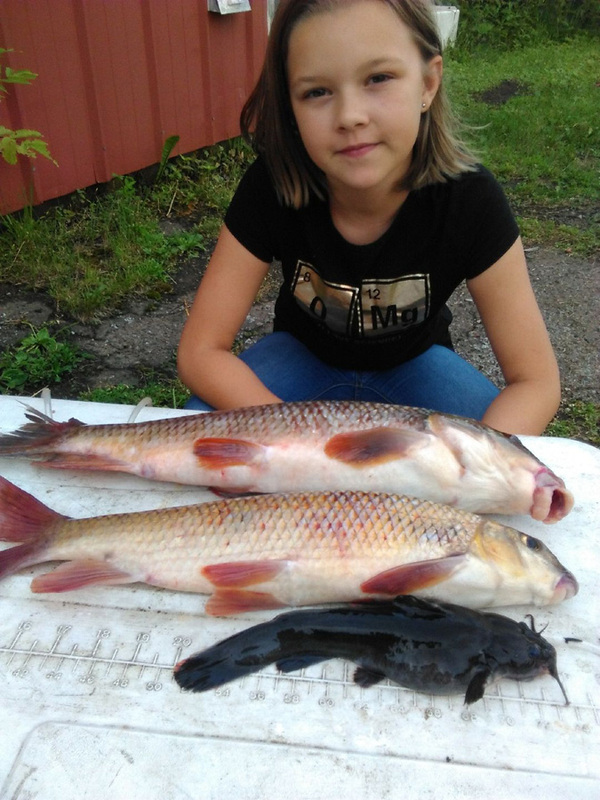 The 12-year-old sixth grader from Merrill, Wis., set three fish records in a single day, spincasting a fish story that begins with the love between a daughter and her father and their appreciation for Wisconsin’s lesser known fish: shorthead redhorse; golden redhorse; and stonecat. “It was exciting,” says Parker. Her fish story begins 40 years ago, when her dad was growing on up a resort on Pelican Lake between Rhinelander and Antigo. From the time Alan Welch could walk he was catching fish, and by the time he was his daughter’s age he was guiding resort guests on fishing trips and cleaning the fish they caught for money to buy a new bike. When his daughter Parker was a toddler, Welch introduced her to fishing and the two became fishing buddies, a shared bond and commitment to the outdoors that mom Jackie Welch appreciates. Parker became an accomplished angler although the father and daughter mostly focused on lesser known species in surrounding lakes and streams. Parker enjoys fishing, and continues to make time for it even as she maintains a 4.0 Grade Point Average in school, serves as the wrestling team manager, and shot her first buck this fall. One day last year her father told her about his idea of trying to set multiple fish records. “I wanted to do it all on the same day so it was hard to beat,” he says. That the pair set out to accomplish the feat on July 4th was coincidental; they knew from fishing those species before that the catching was easier when it was sunny and hadn’t rained for a couple of days. Fishing from shore with nightcrawlers, Parker caught the shorthead red horse in the morning on the Prairie River. “At that point, I think we knew we could get all three in a day,” Alan says. Parker caught the golden redhorse at noon, and then the pair went home until nighttime, when they went fishing on the Wisconsin River and caught the stonecat, a member of the catfish family whose name reflects its habit of hiding out under stones or logs during the day. The fishing duo took Parker’s catches to a meat market in Wausau to get them weighed. “Most of them had never seen a fish like that. We had some comments, but they were happy for us,” Alan Welch says. The daughter and father fishing duo are not ready to rest on their laurels. They’re angling for two records this summer: greater redhorse and longnose sucker. MADISON – The Wisconsin Department of Natural Resources has named Keith Warnke as the state’s new R3Team supervisor. Warnke will oversee the development and coordination of a specialized team dedicated to recruitment, retention and reactivation of hunters, anglers and trappers – a priority within the DNR and conservation agencies nationwide. Warnke will remain in the Madison DNR office, where he has served as the hunting and shooting sports coordinator since 2011. Warnke also guided the state’s big game program for seven years. His first full-time job with the DNR included hunter recruitment programs during the 1990s. 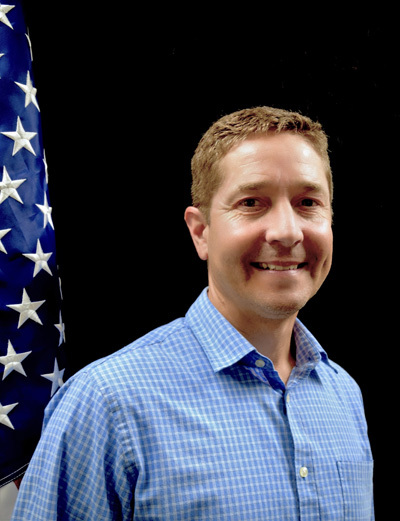 Warnke’s previous work experience includes common loon research, farmland wildlife research legislative aide and leading the state’s upland wildlife program. Warnke graduated from the University of Wisconsin-Madison and the University of Minnesota. MADISON – Prairies, oak barrens and oak savannas and other imperiled natural communities on Wisconsin State Natural Areas got a big boost in 2017 and stand to get more of the same in 2018. Thanks to warm and dry fall weather in 2017, success in securing grant money, strong partnerships, donors and volunteers, State Natural Areas containing these rare natural communities received a record level of management. SNA crews, field ecologists and partners enhanced 12,500 acres by cutting brush, pulling and spraying invasive plants, seeding areas with native plants, and conducting many other management activities. Their greatest gains came from applying prescribed fire to the land to control invasive plant species and jumpstart growth of native wildflowers and other desirable plants. State Natural Areas feature outstanding examples of Wisconsin’s native natural communities, significant geological formations and archeological sites and are often the last refuge of many rare plants and animals. Prairies and oak savanna are among the natural areas getting the most attention. They once covered each more than 5 million acres in Wisconsin and now less than one-tenth of 1 percent remain. DNR’s Natural Heritage Conservation Program employs 20 limited term staff stationed in seven geographically based work crews to manage State Natural Areas and work cooperatively with other DNR programs to manage natural areas within state parks, forests and wildlife areas. In 2017, State Natural Areas also benefitted from work done by 36 volunteer groups organized under the SNA Volunteer Program, and from work done under new and formalized partnerships. For example, a new memorandum of agreement with four partners in the Chiwaukee Prairie Illinois Beach Lake Plain, a 4,000-acre complex of wetlands and prairies straddling the Wisconsin and Illinois border, now enables partners to coordinate and conduct restoration, management and outreach work across borders. This agreement allowed an Illinois partner to lead a 286-acre burn in fall 2017 on land including Chiwaukee Prairie State Natural Area in Wisconsin. A new partnership, the Wisconsin Interagency Prescribed Fire Training Exchange, brought federal field staff to Wisconsin to get more experience conducting prescribed burns on conservation lands including State Natural Areas. The Natural Resources Foundation of Wisconsin also helped to secure funds to manage several areas. Find state natural areas by county by searching the DNR website, dnr.wi.gov, for “SNA.” Donate to the Endangered Resources Fund online or through filling in an amount on your Wisconsin income tax form to help get more work done on State Natural Areas. MADISON – Now is your chance to get outside and get some exercise while exploring some of Wisconsin’s most pristine public lands. 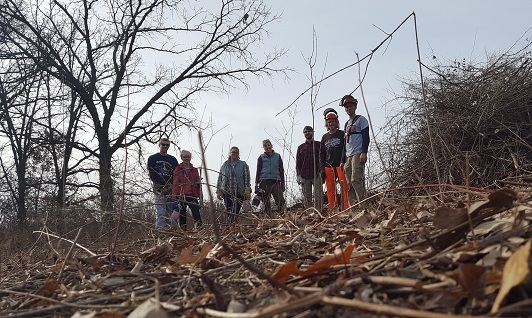 Sign up for any of the nearly two dozen winter volunteer workdays scheduled at State Natural Areas throughout Wisconsin this winter. Morning workdays are scheduled at many sites throughout the state, typically from 9 a.m. to noon, mostly on Saturdays. Volunteers need no training beforehand, but are provided equipment and training on site to complete the work, which typically involves helping cut, pile and burn brush or scattering prairie seeds on snow. Enjoy camaraderie, exercise and great views at winter volunteer workdays at many Wisconsin State Natural Areas. State Natural Areas feature outstanding examples of Wisconsin’s native natural communities, significant geological formations and archeological sites and are often the last refuge of many rare plants and animals. While nearly all state-owned natural areas are open for activities including hiking, nature photography, bird watching and hunting, they are largely undeveloped. Among sites where people can lend a helping hand and volunteer are Observatory Hill in Marquette County, which famed naturalist John Muir explored as a child, Ridgeway Pine Relict, and several other sites with beautiful ice formations. Many sites feature majestic bur oaks that will really stand out against the winter landscape. A list of workdays and flyers for each event can be found by searching the DNR website, dnr.wi.gov, for keywords “SNA volunteers.” Here, people can also sign up to receive email notices for workdays at state natural areas throughout Wisconsin. For more information regarding this volunteer program, contact Jared Urban via email at jared.urban@wisconsin.gov. 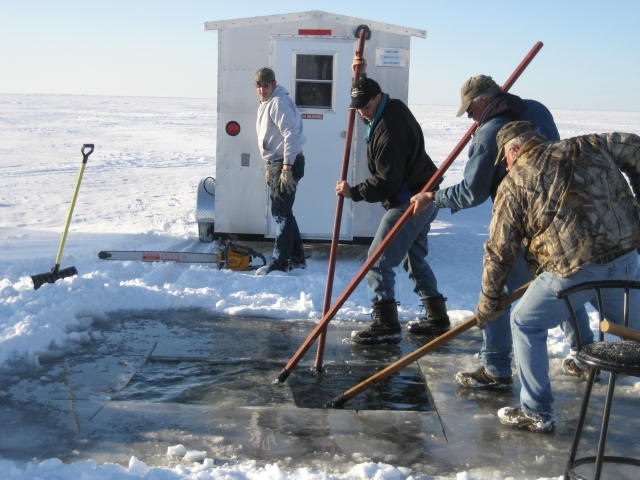 OSHKOSH, Wis. – Family, friends, big fish and fun are on tap Feb. 10 for the opening day of sturgeon spearing season on the Lake Winnebago system. The Winnebago System is home to the world’s largest self-sustaining population of lake sturgeon, with an estimated 19,000 adult females and 24,000 adult males, and a unique spearing season dating back more than 85 years. Interest in sturgeon spearing continues to be strong, as 12,979 licenses (12,505 for Lake Winnebago and 474 for the Upriver Lakes) were sold for the 2018 season. Licenses were sold to spearers in 71 out of 72 Wisconsin counties and representatives from 32 U.S. states and one Canadian province. According to Koenigs, there are more fish in the system now than there have been for decades, with an impressive complement of large fish that has been unrivaled since inception of the modern spearing season in 1932. In 2017, 19.3 percent of the female sturgeon handled during spawning stock assessments were larger than 70 inches. 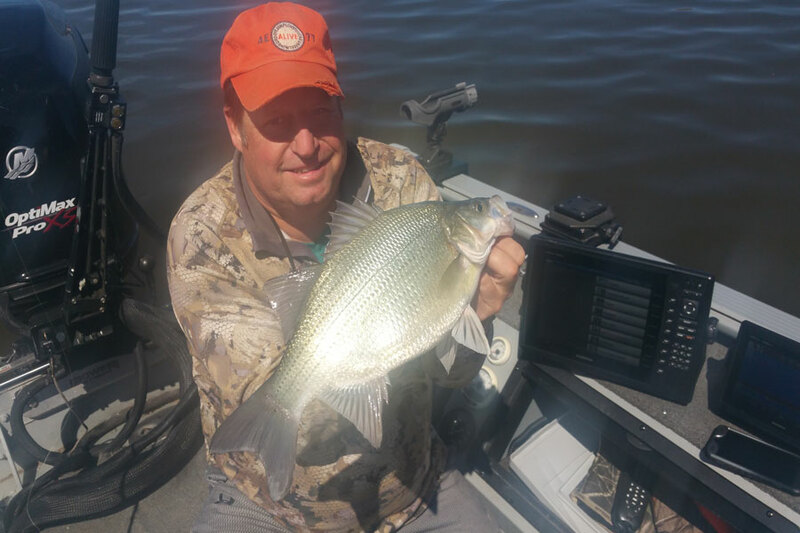 Fish harvested in 2017 had fed well on a strong gizzard shad hatch in 2016 while the forage base observed in 2017 assessments was not as strong as years past. In 2017 54 fish exceeding 100 pounds were harvested, including an 83.4 inch, 154.9 pound fish harvested by Gerald Petersen and a 78.5 inch, 154.7 pound fish taken by Sandra Schumacher, both registered at Stockbridge Harbor. 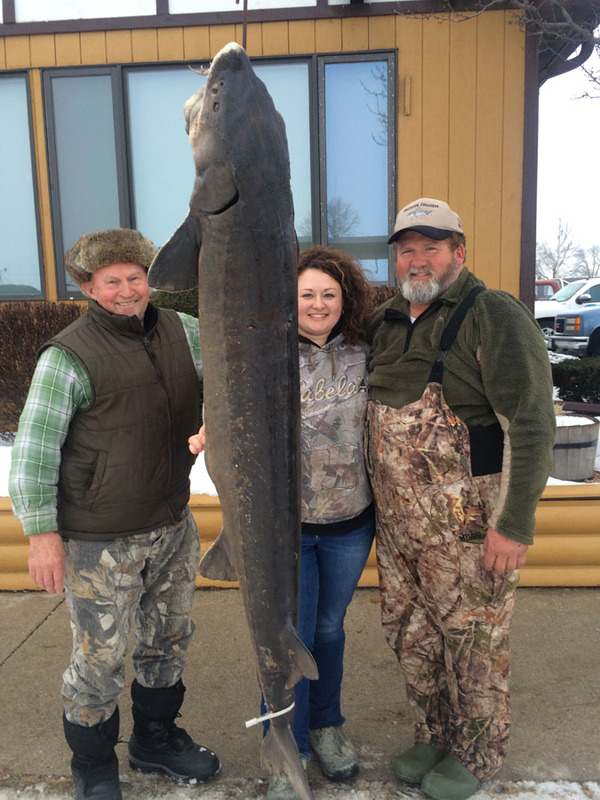 Sturgeon spearing opens at 7 a.m. Saturday, Feb. 10 and may run for up to 16 days until Feb. 25. However, an earlier closure may be triggered if pre-set harvest caps are reached. The system-wide harvest caps are similar to those set for the 2017 season: 430 juvenile females, 950 adult females and 1,200 males. A sturgeon spearing license and tag is required to spear sturgeon. Spearing hours run from 7 a.m. to 1 p.m. and all sturgeon must be presented at a DNR operated registration station by 2 p.m. of the same day the fish is harvested. Successful spearers must immediately validate their carcass tag by removing the validation stub. They do not need to attach validated carcass tags to harvested fish before registration as long as the spearer stays with the fish until registration. However, the harvest tag must be attached to the sturgeon if the spearer leaves the fish prior to registration. DNR staff recommend that spearers bring a clear plastic zip-top bag and tie to protect and secure the paper tag to the fish. OSHKOSH, Wis. – Wisconsin’s oldest fish species – lake sturgeon present when dinosaurs roamed the earth – is set for an updated management plan. Sturgeon lovers can help shape that plan by attending one of eight public meetings statewide in mid-February and early-March. Lake sturgeon are currently managed under guidance from the 2000 Lake Sturgeon Management Plan. An updated plan will allow DNR staff and partners to continue to build on the previous plan’s success, set new goals, and include management strategies for both lake sturgeon and shovelnose sturgeon management. It is important to note that the previous plan did not include shovelnose sturgeon. Tuesday, March 6 – Oconto, 6 p.m., Oconto City Hall, 1210 Main St. There also will be future opportunities for people to comment online, and materials prepared for the meetings will be posted online as they become available. Wisconsin has long been regarded as a national and international leader in sturgeon protection, restoration and research – a reputation built since DNR began regulating sturgeon harvest on the Winnebago system in 1903. Wisconsin offers a hook-and-line season on multiple major rivers with healthy, growing populations and boasts the world’s largest self-sustaining population of lake sturgeon. In locations where sturgeon populations are not as strong, DNR and partners are working to rebuild sturgeon populations. MADISON – Department of Natural Resource staff confirmed trail camera photos of a cougar in Fond du Lac County in early January in addition to confirmation of a cougar moving through Lincoln and Langlade counties in mid-December. The December photos were captured on one property northeast of Merrill on the same day with two separate trail cameras. Eight days later, two separate photos were captured on a property south of Antigo. 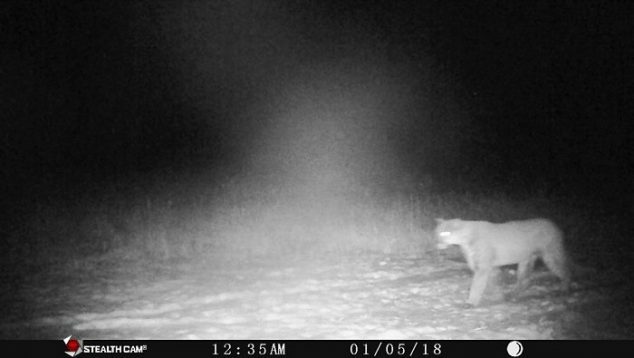 Later in January, cougar photo was confirmed near Rosendale. The properties near Antigo and Merrill are roughly 23 miles apart, and these photos present the possibility that this was the same cougar, moving in an easterly direction. It is unknown whether these photos show the same animal photographed on multiple trail cameras in central Wisconsin between early August and late October 2017, or of the cougar reported in Douglas County in mid-November. Cougars can travel long distances in a short time period. Without biological material for genetic testing, department staff are unable to confirm whether this is one or multiple cougars. As a reminder, suspected cougar sightings can be reported by searching the DNR website, dnr.wi.gov, for large mammal observation form. Confirmed cougar sightings August 2017-January 2018Click image for larger size. Cougars are a protected species in Wisconsin and hunting is not allowed. Cougars are not considered a threat to public safety, and in the unlikely event that a person is confronted by a cougar, face the animal and spread your arms and open your coat or jacket to appear larger. If a cougar approaches, make noise and throw rocks or sticks. MADISON – Hunters registered 3,971 birds during the fall 2017 wild turkey season, a decrease from 4,990 turkeys registered during the 2016 fall season. The harvest success rate was 6.4 percent, compared to 7.3 percent in 2016. Success rate is calculated based on the number of harvest authorizations (formerly known as a tag or permit) sold and is not corrected for non-participation. In total, 102,550 harvest authorizations were available within seven Turkey Management Zones in 2017, but only a 62,239 harvest authorizations were issued, down from 67,906 issued in 2016. Harvest authorization levels are determined by recent trends in harvest, hunter success and turkey reproduction, as well as hunter densities and field reports of turkey abundance. “The fall turkey season provides a much different experience for turkey hunters than does the spring hunt, and we have a dedicated group of hunters that enjoy pursuing turkeys in the fall woods–in particular, those who hunt turkeys with dogs,” said Mark Witecha, Department of Natural Resources upland wildlife ecologist. The department first initiated a fall turkey season in 1989 after an increase and expansion of turkeys throughout the state. Since then, hunters have been able to pursue turkeys during both fall and spring seasons. MADISON – The 2018 spring turkey harvest authorization drawing has concluded and 138,144 successful applicants will receive spring wild turkey harvest authorizations. A total of 244,218 authorizations were available for the spring 2018 turkey season. The leftover harvest authorizations not issued in the drawing will be available for purchase beginning March 19. Postcard notifications to successful applicants have been mailed. Hunters can also monitor their harvest authorization status in their online account at GoWild.WI.gov. Along with a spring turkey harvest authorization, a valid 2018 spring turkey license and Wild Turkey Stamp is required to hunt turkeys in Wisconsin. Stamps and licenses may be purchased online at GoWild.WI.gov, or in person at any license agent or DNR Service Centers, beginning in March at the start of the license year. The spring turkey season begins on the third Wednesday in April. The 2018 spring season will run from April 18 through May 29, with six seven-day periods running Wednesday through the following Tuesday. Hunters are reminded that the Fort McCoy spring turkey hunting season is managed separately from the State of Wisconsin spring turkey hunt. Hunters may apply for a 2018 spring turkey harvest authorization at Fort McCoy only if they have not received one through the regular spring turkey drawing. Applications can be obtained from Fort McCoy by calling 608-388-3337 or visiting www.mccoy.army.mil [EXIT DNR]. Spring turkey hunting regulations can be found within 2017 Small Game Hunting Regulations, 2017 Fall Turkey Regulations and 2018 Spring Turkey Regulations [PDF]. The leftover harvest authorizations for the 2018 spring turkey hunting season will be sold on a first-come, first-served basis beginning Monday, March 19 at 10 a.m. Leftover harvest authorizations will be first issued for sale by zone, one zone per day. Leftover harvest authorizations can be purchased online at GoWild.WI.gov, or in person at any of more than 1,000 Go Wild license sales locations. Hunters are encouraged to check the turkey management zone map [PDF] and the leftover harvest authorization availability page to see if harvest authorizations are available for the period and zone in which they wish to hunt. Zones 5 and 7 – Friday, March 23. After zone-specific sales, all remaining turkey harvest authorizations will be made available for purchase Saturday, March 24. Extra turkey harvest authorizations can be purchased at a rate of one per day until the zone and time-period sells out or the season closes. Leftover turkey harvest authorizations cost $10 for residents and $15 for non-residents – each will have equal opportunity to purchase leftover harvest authorizations. Purchasing a leftover harvest authorization will not affect preference point status for future turkey drawings. Youth hunters under the age of 16 may hunt during the youth turkey hunt on April 14-15. Youth hunters must be accompanied by an adult over the age of 18. During the youth hunt weekend, hunters under the age of 12 and youth hunters who have not completed a hunter education course can hunt under the Mentored Hunting Program. Special rules and regulations apply. Each youth hunter must have a valid spring 2018 turkey harvest authorization, license and Wild Turkey Stamp. A current, valid harvest authorization issued for any time-period can be used during the youth hunt, but the youth hunter must hunt within the turkey management zone indicated on their harvest authorization. Youth hunters may harvest only one male or bearded turkey during the two-day hunt. Youth who do not successfully harvest a turkey during the youth hunt may use their unfilled harvest authorization for the time-period and zone for which their authorization was issued. 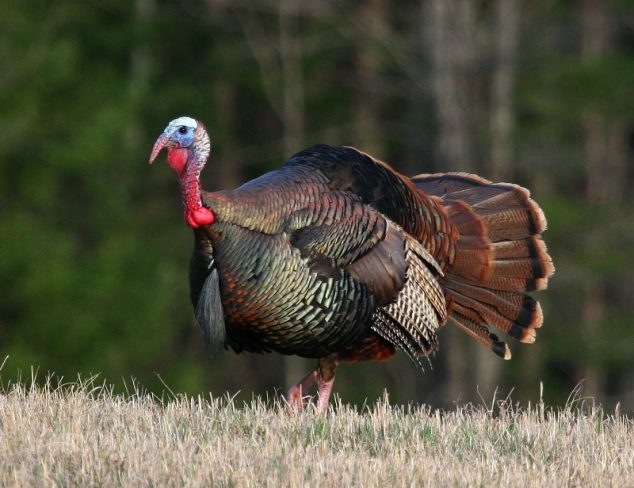 All other spring turkey hunting regulations [PDF] apply. Each year, thousands of outdoor enthusiasts use Wisconsin’s public lands for a variety of activities, ranging from birdwatching to hunting. For those interested in exploring all Wisconsin has to offer, the department has a number of tools available to help users find a new favorite spot in the wild. MADISON — A rollercoaster of seasonal temperatures and changing snow levels have launched Wisconsin’s early snowmobile season, prompting Wisconsin Department of Natural Resources Snowmobile Administrator/Warden Gary Eddy to urge operators to review important safety tips to prepare for safe and fun rides. Many northern counties have opened some or all of their snowmobile trails and snowmobile enthusiasts have been able to take advantage of some early season riding. However, Eddy adds, many trails are in need of new snow to freshen conditions. Review the Wisconsin Snowmobile Regulation pamphlet at dnr.wi.gov, keyword snowmobile — and make sure you have a valid trail pass and registration. Use of hand signals is voluntary, not mandatory. If you are inexperienced or uncomfortable giving a hand signal…don’t! Focus on staying in control and to the right. Check trail conditions on Travel Wisconsin’s Snow Report webpage or with local snowmobile clubs; ice conditions with local bait shops, clubs or sheriffs’ departments. Snowmobiling on frozen waters demands extreme caution for unique hazards – including open water areas and weak ice. Lack of adequate snow on the ice affects steering, braking and overall control. Carry or wear a life vest, always ride with a companion and refrain from riding at night. Ask local fishing clubs and bait shops about waterways ice covers. All operators at least age 12 and those also born on or after January 1, 1985 are required to possess a valid, snowmobile safety education certificate to legally operate solo. Certificates issued by other states/provinces are honored. Learn more by visiting the dnr.wi.gov and searching keyword snowmobile safety. Stay on marked trails and routes. Snowmobile clubs work hard to secure permission for trails on private property. Cutting corners or going off trail, upsets landowners and closes trails. Don’t ruin the experience for others. Practice “Zero Alcohol” which is a personal choice to not consume any alcohol while snowmobiling. Riders wait until they are done riding before consuming any alcohol. Stay to the right hand side of the trail, especially on hills and corners. Taking the middle of the trail on hills or corners is highly unsafe, irresponsible and illegal.